The Gallery is located on the second floor of the First Parish in Bedford, in the reception rooms above our Sanctuary. On Sunday, February 10, 2019 from 11:30am – 1:30pm, there will be a public reception in the Gallery. All facilities are handicapped accessible. 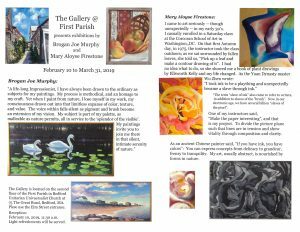 Thank you for your interest in exhibiting your work at the Gallery @ First Parish; the Gallery Team appreciates your interest and involvement. All work must be framed and ready to hang using picture wire; saw-tooth hangers or clips are unacceptable. The picture wire should be placed on the upper third of the picture and it is important that the wire be taut. Please see the instructions for hanging artwork attached below. Please fill in the Exhibit Application (attached below). Please tape this information label to the back of each picture.